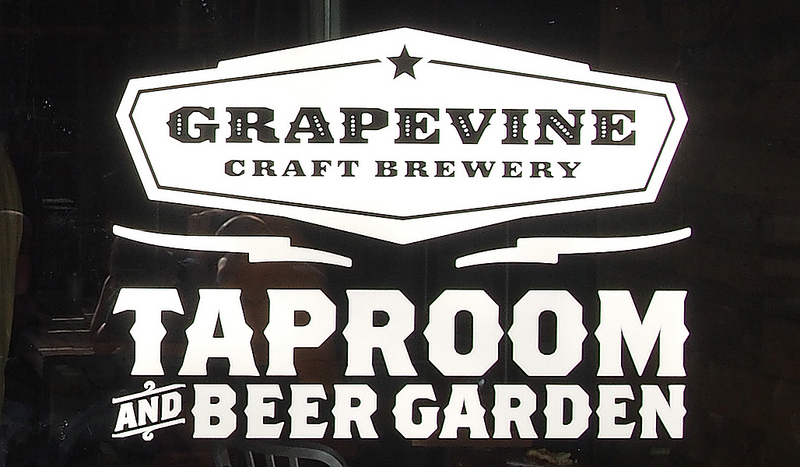 All images the property of Brian Brown/Beer in Big D.
It wasn't long ago that Grapevine Craft Brewery was celebrating the success of a record-setting Fundable campaign meant to help the business get off the ground. Now, just two years later, the brewery is ready to open the doors on a new 11,000 square foot facility in its namesake city. By now you know the story as to how the original plans got derailed, and how owner Gary Humble made the decision to operate temporarily in Farmers Branch in order to make good on a promise to have beer in the hands of his supporters by the end of 2013. They say that all's well that ends well, though, and I imagine after taking in the new facility at a private event last night that Humble is more than happy with how things turned out. Visitors may overlook the coming soon-style sign out along E. Dallas Road, but the big blue building with gray stripes is hard to miss as you approach the site located at 906 Jean Street in Grapevine. Parking is available on the south side of the structure, and is adjacent to the main entrance which you reach by passing through the beer garden. Bar and picnic table seating are available in the Beer Garden. Inside, there's a two-level taproom with expansive views of the brewhouse thanks to walls of windows which exist both upstairs and down. 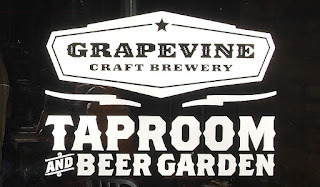 Naturally, the bar features an array of Grapevine beers on tap for your drinking pleasure, one of which will be the brewery's new year-round offering, HopFest United IPA. Brewed with 10 different hop varieties, this bright and flavorful brew was being packaged in six-packs of 12-ounce cans during the event, presumably in preparation for deliveries to retail locations in the coming days. Birds-eye views of the taproom. As for the production space, a thirty-barrel brewhouse sits nestled in the corner of the main area next to a group of 60 and 90-barrel fermenters, with an empty row being reserved for a set of 120-barrel tanks yet to be delivered. Packaging occurs in a separate room towards the rear of the building using an advanced rotary canning line Grapevine acquired back in January. Current estimates put the brewery's annual capacity at 16,000 barrels, though Humble says they'll produce less than half of that in 2015. 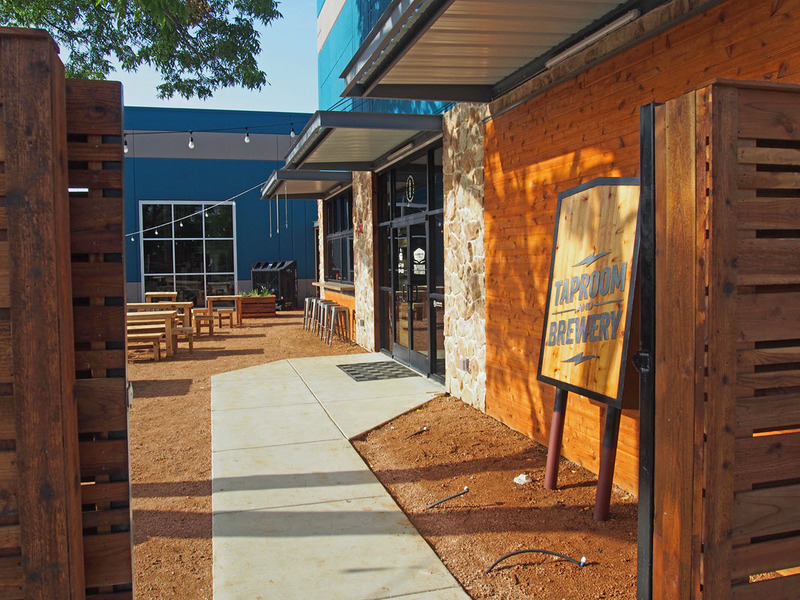 The brewhouse (left) is adjacent to the taproom, while the canning line (right) is seated in the back of the building. All in all, it's an impressive step forward for a brewery that hasn't even reached its two-year anniversary. You, as a consumer, can check it out this weekend during the brewery's grand opening celebration. It's happening today and tomorrow (Friday and Saturday), July 10-11, from 3-10 p.m. each day. Festivities will include live music, food trucks and a slew of special releases tapped especially for the occasion. Taproom hours: Daily, 3-10 p.m.